The CBS Series entitled NCIS: NEW ORLEANS will be filming at St. Charles Avenue & Audubon Place on Thursday Feb 21st, 2019. The main company will move in and begin filming in the area from approximately 3pm-10pm. On the day of filming their crew parking and base camp will be situated in private lots to minimize impact in the area. All driveways and handicap zones will be respected. If you have any loud construction work or large deliveries scheduled for the day in question, they ask that you please let them know in advance so they can accommodate your needs. There will also be ITC (Intermittent Traffic Control) between the hours of 7am and 7pm, excluding rush hour times, at the intersection of St Charles Ave and Audubon Pl on Thursday Feb 21st, 2019. The New Orleans Historic District Landmarks Commission will hold a special meeting this Friday, February 22, 2019 at 9:30 AM in the City Council chamber, located at 1300 Perdido Street. 5200 Saint Charles Avenue is on the agenda, and the public is welcome to attend. The meeting was originally scheduled to take place on February 6th, and has been rescheduled for February 22nd. Below is an excerpt from the meeting agenda. 5200 St Charles Ave: St. Charles Avenue Historic District, Full Control: Corbett Scott, applicant; Will Owen Blankenship, owner; Renovation and addition to an existing accessory structure. ​(http://onestopapp.nola.gov/Redirect.aspx?SearchString=19-00375-HDLC). The City Council failed to vote on a zoning-change request within 60 days of the City Planning Commission’s recommendation, Therefore, plans for a nail salon at 7457 St. Charles Avenue, uptown, have been halted. Paul Masinter, President of the St. Charles Avenue Association, had written to the council members expressing SCAA’s opposition to the salon and was one of three speakers at the February 7th meeting. The building owner needed a conditional-use permit to operate as a neighborhood commercial establishment, since the building had been vacant since 2017. There is a two-year waiting period before the building owner can submit another request for the zoning change. 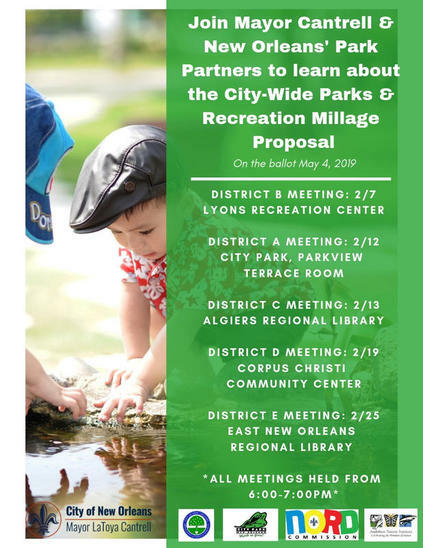 Join Mayor LaToya Cantrell and New Orleans' Park Partners to learn about the city-wide parks millage proposal (on the May 4, 2019 ballot) in a series of neighborhood meetings that run from Feb. 7 through Feb​. 25 throughout the city. The public meeting for District A will take place tomorrow, Tuesday, February 12th 2019 at 6 PM, at City Park's Parkview Terrace Room. The New Orleans Historic District Landmarks Commission will hold its next regularly scheduled meeting on Wednesday, February 6, 2019 at 1:30 PM in the City Council chamber, 1300 Perdido Street. Saint Charles Avenue is on the agenda for the meeting, and the public is welcome to attend. 5200 St Charles Ave: Corbett Scott, applicant; Will Owen Blankenship, owner; Renovation and addition to an existing accessory structure (http://onestopapp.nola.gov/Redirect.aspx?SearchString=19-00375-HDLC). ​The City Council Vote on the proposed Nail Salon at 7456 St. Charles Avenue has been postponed. SCAA Board member John Bendernagel attended the public meeting on January 8th. The owners have decided to eliminate the second floor and will make new drawings available. The New Orleans Historic District Landmarks Commission will hold its regularly scheduled meeting on Thursday, December 13, 2018 at 1:30 PM in the City Council chamber, 1300 Perdido Street. St. Charles Avenue is on the agenda. The public is welcome. 3540 St. Charles Ave: Saint Charles Avenue Historic District, Full Control: Harvey Burns, applicant; The Hibernia National Bank, owner; Installation of drive-thru ATM and canopy addition. The meeting will take place in the City Council Chamber (City Hall 1E07), 1300 Perdido Street, New Orleans, LA 70112. Read more in the meeting agenda. The New Orleans City Planning Commission will hold public hearings on Tuesday, October 23, at 1:30pm, on proposed amendments to the comprehensive zoning law, property dispositions and subdivisions. The commission will take action or make a recommendation at the conclusion of each public hearing. The Old Business section of the meeting agenda includes a mention of St. Charles Avenue. An excerpt from the agenda is below.